My Thoughts: I don't know what to say about this one. It was good but in a different way. I love the Romeo and Juliet story. I loved the movie. I was a big fan of Romeo and Juliet growing up so I was excited to get this book. We are introduced to Romeo and Juliet. Juliet was murdered by Romeo. He did this so he could become apart of the Mercenaries, that destroy beauty and goodness and inhabit the bodies of the dead. Juliet also lives eternally as a worker for the Ambassadors of Light, who try to spread love. Juliet returns to Earth in a new body whenever soul mates-who are becoming more and more rare-need help finding each other. Romeo is sent to do the opposite, to destroy love. Romeo inhabits the body of Dylan and Juliet inhabits the body of Ariel. They go to the same school, so its quite convenient that they will be so close to each other! Its also a miracle that the day they were put into the bodies, the two (Dylan and Ariel) were out on a date! A date that went horribly wrong. Juliet has a pretty easy job finding the girl she was supposed to help; Ariel's best friend Gemma. Then there is Ben, who Juliet meets and finds out that Gemma has been "seeing" him. The plot is pretty simple. Get the two soul mates together before Romeo has a chance to stop Juliet. But things are different this time, Romeo believes there is more to the story than they've ever known and something has changed. Lets see, did I like this one? I did but didn't love it as much as I think I could have. Juliet Immortal was an interesting read. But it wasn't near as good as the original (duh). It did put a weird spin on things though. Things weren't always as they seemed and Juliet and Romeo's life changed quite a bit. Things were different this time, they weren't sure if they were supposed to get the soul-mates together or not. It was also kind of confusing at times. I was unsure of what was really going on and it took a while for it to sink in. 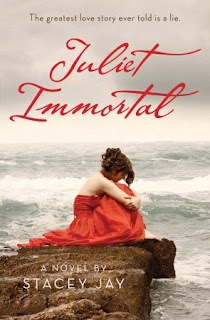 Juliet Immortal was a good story but nothing like the original, but that is the point. Overall: I liked it a lot, but didn't love it as much as I hoped for. I was hoping this book would get 5 cupcakes out of me, but it only got 4. I liked the ending the most I think. Cover: Its a beautiful cover! Love it! Love how she is just sitting there near water. Isn't it awesome? I was going to read this one a while back, but gave it away before I got the chance. You've really made me want to get a new copy, though! I've been debating picking this one up. Ditto that I'm a HUGE fan of the original, and when it comes to retellings of my favorite books/characters, it's hit or miss for me. And I've seen tons of differing opinions on this one, so I think I'm still a bit hesitant, but we'll see!